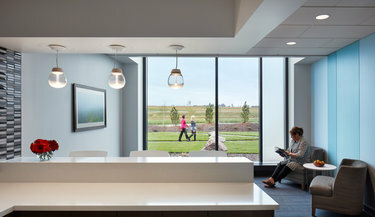 Knowing that their new 65,000 square-foot replacement hospital would need to position them for the future, the leadership of Gundersen St. Joseph's in Hillsboro, Wisconsin, teamed with HGA to conduct a deep analysis of service lines and processes. Adaptability and flexibility quickly emerged as overriding themes for the new facility. Almost every space is positioned to adapt to change; each room is designed to maximize every square inch, with no space ever sitting idle. Amy Douma presented “Rural Healthcare Facilities as Innovation Incubators” with HGA colleague Kiki Werkheiser, and Danielle Gearhart, FACHE, of Gundersen St. Joseph's Hospital, at Healthcare Facilities Symposium & Expo, October 2018. 1. National Conference of State Legislatures. 2. National Rural Health Association.